Caribe Resort water-front condominium for sale in Orange Beach Alabama. 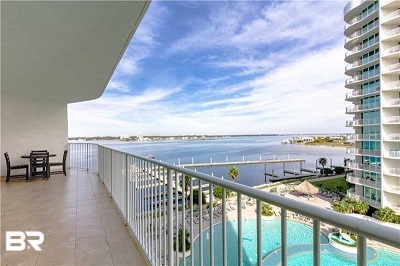 Enjoy the best view the island has to offer from this 2BR/2BA Unit! Take in both bay and gulf views from the large and spacious balcony as well as the master bedroom. This updated and well kept condo has high end furnishing and new flooring in both bedrooms. The large and open floor plan provides plenty of room to stretch out after a long day on the water. The master bedroom has 2 chairs that fold out to twin beds and increases the sleeping arrangements to accommodate 8 people. Caribe amenities include a lazy river, multiple indoor and outdoor pools, state of the art fitness room, putting green, tennis/pickleball court, bocci ball, and much more. Call to schedule your viewing today! Don’t miss this one, come see this Orange Beach condominium home at Caribe Resort. Situated on the emerald waters of Gulf of Mexico, Orange Beach has subtropical weather and miles of white-sand beaches and access to the interior waterways north of the popular beaches. Visitors can also enjoy a lengthy list of Orange Beach attractions including Adventure Island, deep-sea fishing, numerous area Golf Courses, the Alabama Gulf Coast Zoo, Waterville USA, The Wharf and more. Enjoy the many popular Orange Beach eateries like Voyagers, Cosmos’s, Ginny Lane, Louisiana Lagniappe, Cafe Grazie and more. Whether you’re ready for fun and adventure, a carefree day on the beach, tasty cuisine or an Orange Beach home – you can find it all on Alabama’s Gulf Coast.